The diagram here is intended to show at a glance why Euclid's proof of Proposition 47 of Book I of the Elements works. 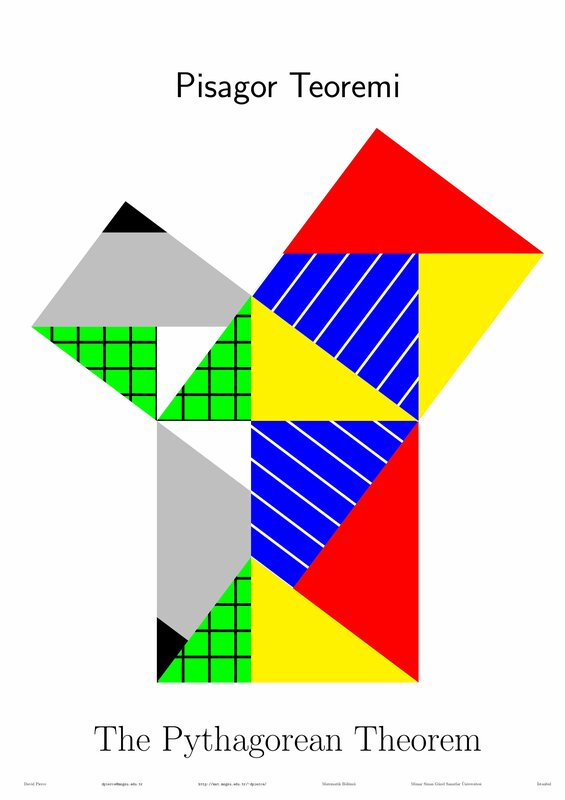 The square on the right, consisting of red and yellow triangles and a blue quadrilateral, can be rearranged to form the rectangle on the right. This is because the square and rectangle are equal to the congruent parallelograms, lying respectively between the same parallel lines and on the same bases. These two parallelograms can be made out in the diagram. (It may be noted that each of the red triangles is equal to a combination of a yellow and green triangle.) Similarly, the square on the left is equal to the rectangle on the left. But the two rectangles compose a square. I have crosshatched the green triangles and dotted the blue quadrilaterals, in case some people have trouble distinguishing colors. However, I had trouble converting the dot effect to jpg format and even to pdf format. In fact I had trouble achieving the effect at all. The psboxfill macro for pstricks did not work for me as the manual suggested, and so I had to use a workaround. This gave me the dots. I made the svg file by using online-convert.com. First I tried inkscape in my own computer: this converted the diagram fine, but not the text. That there is no background for the svg image is not intentional. The ps file did not convert properly to pdf; so I just went back and replaced the dots with lines.